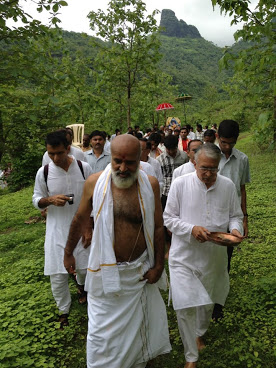 Padyatra is a very powerful Sadhana intuited by Guruji. Its duration is generally 3 months. Also called walking pilgrimage by some, it is about going around like a renunciate, living on whatever is offered in love. Padyatras in India are a particularly special experience. This country is blessed with a culture wherein everybody reveres a sadhak and provides him with free food and shelter if he is doing his Sadhana of Moksha.